Blind Workers’ Union all-up against violation of their labour rights and government inaction. Blind Workers’ Union warns Social Justice Ministry of grave consequences if alternative jobs are not provided to retrenched blind workers. 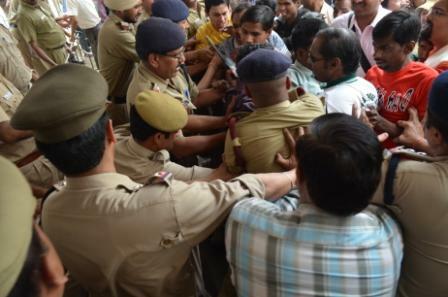 Today (March 27), Blind Workers’ Union in mid of heavy deployment of police and barricades, staged a massive demonstration outside the Sarai Rohilla Railway Station in Delhi. 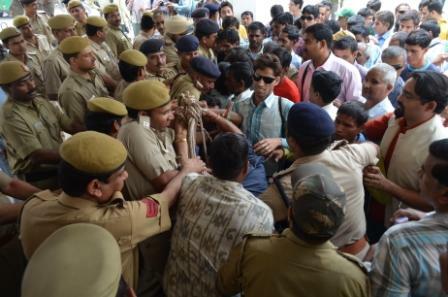 Initially the unemployed blind workers tried to enter the railway station and block the rail traffic but the heavy contingents of police did not allow them to enter the railway track from any side. 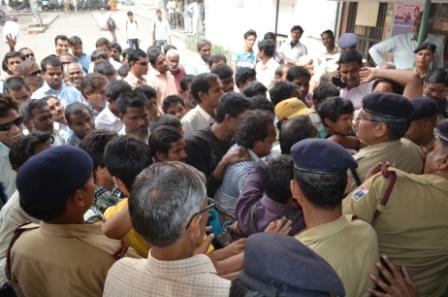 Thereafter these blind workers shouted anti-government slogans and held a protest meeting outside the station. It is to be noted that the Blind Workers’ Union has been raising the issue of violation of blind workers basic labour rights since November, 2011. We have been raising our voice against violation of basic labour rights like minimum wage, PF, bonus, overtime payment etc. 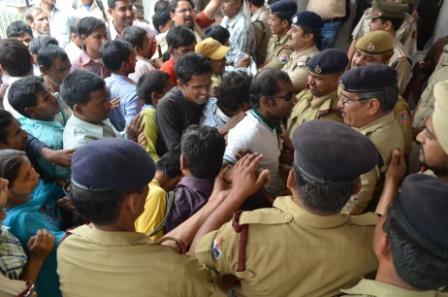 The workers were deeply agitated over the fact that despite several representations to the Ministry of Social Justice and Empowerment, there has been no concrete step taken either against the erring employers or to give these blind workers employment in public sector. These blind workers were thus forced to take up this drastic step so that general public becomes aware of their misery. These blind workers are demanding employment in public sector so that their rights are not violated by NGOs and private enterprises. 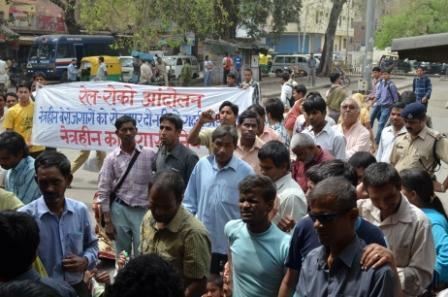 In their most recent memorandum to Social Justice Ministry these blind workers demanded that the Ministry must make alternative provisions of jobs for these blind workers before 27th March or else they will be left with the alternative of either die of hunger or carry an all-out struggle against government. In the protest meeting that was carried out outside the station it was resolved that this struggle of blind workers should be taken as an ultimatum by the government. They further warned the government and ministry that if they fail to provide employment immediately to these blind workers then from next month onwards they would be forced to carry out this Rail Roko in different parts of the country and next time they would even defy police.